The Cisco Nexus® 3064-X, 3064-T, and 3064-32T Switches are high-performance, high-density Ethernet switches that are part of the Cisco Nexus 3000 Series Switches portfolio. These compact one-rack-unit (1RU) form-factor 10 Gigabit Ethernet switches provide line-rate Layer 2 and 3 switching. They run the industry-leading Cisco® NX‑OS Software operating system, providing customers with comprehensive features and functions that are widely deployed globally. They support both forward and reverse airflow schemes with AC and DC power inputs. The Cisco Nexus 3064 switches are well suited for data centers that require cost-effective, power-efficient, line-rate Layer 2 and 3 top-of-rack (ToR) switches. 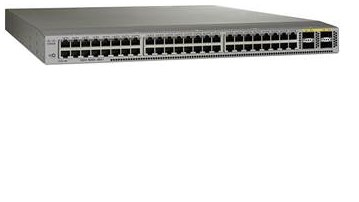 Cisco Nexus 3064-32T (Figure 2): This switch is the Cisco Nexus 3064-T with 32 10GBASE-T ports and 4 QSFP+ ports enabled. The ports are enabled through software licensing. This switch provides a cost-effective solution for customers who require up to 32 10GBASE-T ports per rack. This switch comes with a 32-10GBASE-T port license preinstalled. To enable the remaining 16 10GBASE-T ports, the customer installs the 16-port upgrade license. - The Cisco Nexus 3064 switches provide Layer 2 and 3 switching of up to 1.2 terabits per second (Tbps) and more than 950 million packets per second (mpps) in a compact 1RU form factor. - The Cisco Nexus 3064 switches deliver ultra-low nominal latency that allows customers to implement high‑performance infrastructure for high-frequency trading (HFT) workloads. - Virtual PortChannel (vPC) provides Layer 2 multipathing through the elimination of Spanning Tree Protocol and enables fully utilized bisectional bandwidth and simplified Layer 2 logical topologies without the need to change the existing management and deployment models. - PowerOn Auto Provisioning (POAP) enables touchless bootup and configuration of the switch, drastically reducing provisioning time. - Cisco Embedded Event Manager (EEM) and Python scripting enable automation and remote operations in the data center. - Advanced buffer monitoring reports real-time buffer use per port and per queue, which allows organizations to monitor traffic bursts and application traffic patterns. - The 64-way equal-cost multipath (ECMP) routing enables Layer 3 fat tree designs and allows organizations to prevent network bottlenecks, increase resiliency, and add capacity with little network disruption. - EtherAnalyzer is a built-in packet analyzer for monitoring and troubleshooting control-plane traffic and is based on the popular Wireshark open source network protocol analyzer. - Precision Time Protocol (PTP; IEEE 1588) provides accurate clock synchronization and improved data correlation with network captures and system events. - Full Layer 3 unicast and multicast routing protocol suites are supported, including Border Gateway Protocol (BGP), Open Shortest Path First (OSPF), Enhanced Interior Gateway Routing Protocol (EIGRP), Routing Information Protocol Version 2 (RIPv2), Protocol Independent Multicast sparse mode (PIM-SM), Source-Specific Multicast (SSM), and Multicast Source Discovery Protocol (MSDP). - Build simple, scalable and cost-effective network tap or Cisco Switched Port Analyzer (SPAN) aggregation for network traffic monitoring and analysis. The Cisco Nexus 3064 switches support a wide variety of 1, 10, and 40 Gigabit Ethernet connectivity options. 1 and 10 Gigabit Ethernet connectivity is achieved in the first 48 ports, and 40 Gigabit Ethernet connectivity is achieved using QSFP+ transceivers in the last 4 ports. QSFP+ technology allows smooth transition from 10 to 40 Gigabit Ethernet infrastructures in data centers. The Cisco Nexus 3064 switches support connectivity over copper and fiber cables, providing excellent physical-layer flexibility. For low-cost cabling, copper-based 40-Gbps Twinax cables can be used, and for longer cable reaches, short-reach optical transceivers are excellent. Connectivity can be established from the QSFP ports to an upstream 10 Gigabit Ethernet switch using a splitter cable that has a QSFP transceiver on one end and four SFP+ transceivers on the other end. Similar capability can be achieved using optical transceivers by procuring third-party fiber splitters. Table 1 lists the QSFP transceiver types supported.